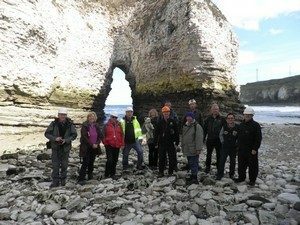 We had another brilliant day with Paul Hindreth across in the East Riding, looking at the Northern Chalk – this time north of the Market Weighton high. We were joined by two from the BGS who were interested in checking the fossil record and strata here too and they discussed several of the interesting theories currently being explored about the chalk. We started at the SSSI of Langtoft quarry, which is thought to be the upper end of the Burnham chalk. However it didn’t show the tabloid flint beds typical of this strata, so there was some debate about this. Bedding was steeply dipping to the south and the quarry over the road, not accessible, would bear further exploration to see if the junction between the Burnham and Flamborough strata was visible. Bivalves, belemnites, styrolites and several surfaces typical of slickensides were identified. We then continued to Selwick Bay, to access it on the falling tide. This has spectacular folded bedding and faulting, especially visible in the cliff face. The wave cut platform also shows clearly the increase in frequency and thickness of calcite veins towards and along the fault lines. Also some iron staining here indicated it had occurred prior to the stresses of the folding mechanism. Paul says the bay’s often used for students to practice mapping and you could certainly see why! The junction between the Flamborough and Burnham sequences was visible by a band of Keuper Marl which had been eroded out. Tabular flint lines, helped to track changes in bedding across the faults and large crystals of calcite are visible in the cliff face. There is a huge variety of pebbles from differing sources on the beach, washed out of the overlying boulder clay. We walked round the northern end into a large cliff fissure eroded out by the sea and enclosed by a spectacular arch – see picture. We ended the day at North Landing, Flamborough where the Flamborough/Burnham chalk boundaries were much more marked; the marl bed very prominent on the eastern headland and accessible on the western one. Here the two oyster beds were also examined, and the paramudra and burrow flints gave additional interest. Again the beds were dipping steadily to the south, but the cliffs were considerably less faulted than at Selwick Bay. Here we were also entertained by nesting kittiwakes, razorbills and guillemots and an inquisitive seal! Definitely worth a return visit and hopefully we’ll have another outing with Paul next year.